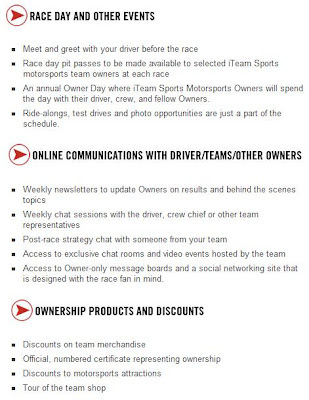 You can purchase an ownership share of HVM Racing. The 21st century sports fan experience is here now as motorsports and fantasy sports combine for the ultimate ownership experience. Sign up today and be among the first fans eligible to own a part of a motorsports team and share in the one-of-a-kind thrill few have ever experienced. Never before have motorsports fans had this kind of opportunity. Within months, iTeam Sports will unveil which teams currently participating in various motorsports series in North America will be part of this great opportunity. The iTeam Sports online network brings you and others who share your passion for racing something you could only dream of before – actual team ownership. And it comes at a reasonable cost - ($199).